Simplestream, the company behind the TVPlayer and a leading provider of ‘Over-the-Top’ (OTT) live streaming services for broadcast TV channels, has announced it has secured an additional £2m in equity funding from a consortium including Beringea, a leading growth capital firm with a focus on media and technology companies, and YOLO Leisure and Technology, an AIM listed investment company. The investment will accelerate the expansion of Simplestream’s video streaming platform in the UK and internationally, and the continued development of TVPlayer, which is to be made available on a white-label basis. Simplestream's broadcast clients include Discovery Networks, Scripps Networks, Box Television, QVC, At The Races and Turner Broadcasting amongst others. Simplestream’s cloud-based Media Manager solution enables broadcasters to securely live stream broadcast content to any device with minimal latency and gain significant workflow efficiencies through the automated creation of multi-bitrate, multi-platform video files from the live stream. The generation of long-form “catchup” programming, with or without ad-breaks, and the creation of short-form video clips are supported via a single system. Simplestream has reported a 100% revenue growth year-on-year since its Media Manager was introduced to the UK market in 2012. The company now delivers services across Europe and North America, with a focus on sport, music, news, faith and teleshopping channels. The additional funding enables the company to support the needs of much larger media companies and follows recent announcements that leading entertainment channels such as Food Network, DMAX and TruTV have deployed Simplestream’s Media Manager as part of their Over-the-Top strategy. The company is expected to announce multi-year contracts with several additional high profile broadcast companies this quarter. 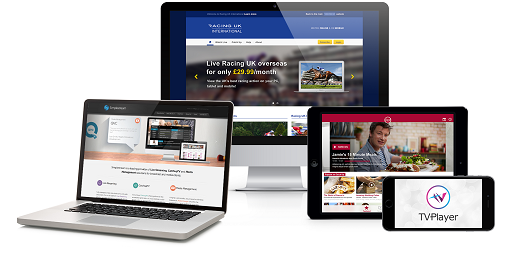 Simplestream also owns and operates TVPlayer, a live TV aggregator of more than 50 free-to-air channels, enabling UK consumers to watch their favourite channels all in one place on desktop, mobile and tablet. The TVPlayer apps have been downloaded over one million times in the UK since they launched. The TVPlayer platform, which is powered by Media Manager, supports live streaming, start-over, catchup, and on-demand viewing, together with in-built subscriber management, pay-per-view and device management capabilities. TVPlayer is expected to be made available on a white-label basis in the coming months, and is targeted at platform operators looking to compliment existing broadcast operations with OTT viewing.